The performance of cation-conducting solid polymer electrolytes is key to improving the efficiency of fuel cells and secondary batteries. However, commercial polymers such as perfluorosulfonic acids and poly(ethyleneglycols) (PEGs) have drawbacks in stability. On the other hand, polyoxometalates (POMs), which are nano-sized anionic metal-oxygen clusters, can efficiently transport protons, while low durability due to hygroscopicity has been a problem. A former student of my group Masaki Tsuboi synthesized a series of crystalline POM-PEG composites, which showed moderate proton conductivity via segmental motion of the polymer moiety (J. Solid State Chem. 234, 9, 2016). At that time, we could not resolve the positions of the PEG by single crystal X-ray diffraction techniques, and our collaborator has recently revealed by neutron scattering techniques that the single PEG chain stays as distorted helix in the nanochannel (P. Yin et al., J. Phys. Chem. Lett. 9, 5772, 2018). In order to improve the proton conductivity of crystalline POM-PEG composites, students of my group Kazuma Niinomi and Satoru Miyazawa have utilized a Preyssler-type [Na(H2O)P5W30O110]14- POM instead of a Keggin-type [PW12O40]3- POM (used in our previous work), because Preyssler-type POMs are known to show higher acidity, which may lead to higher proton conduction. The proton conductivity increased by more than one order of magnitude, while the performance was still far from commercial polymers (Inorg. Chem. 56, 15187, 2017). We became confident from our previous works that a Preyssler-type POM with lower anion charge would facilitate the migration of protons by decreasing the electrostatic interactions between POM and protons. Another point is the use of a polymer with amine groups to increase the number of protonation sites and to extend the hydrogen-bonding network, which may result in efficient proton transport. 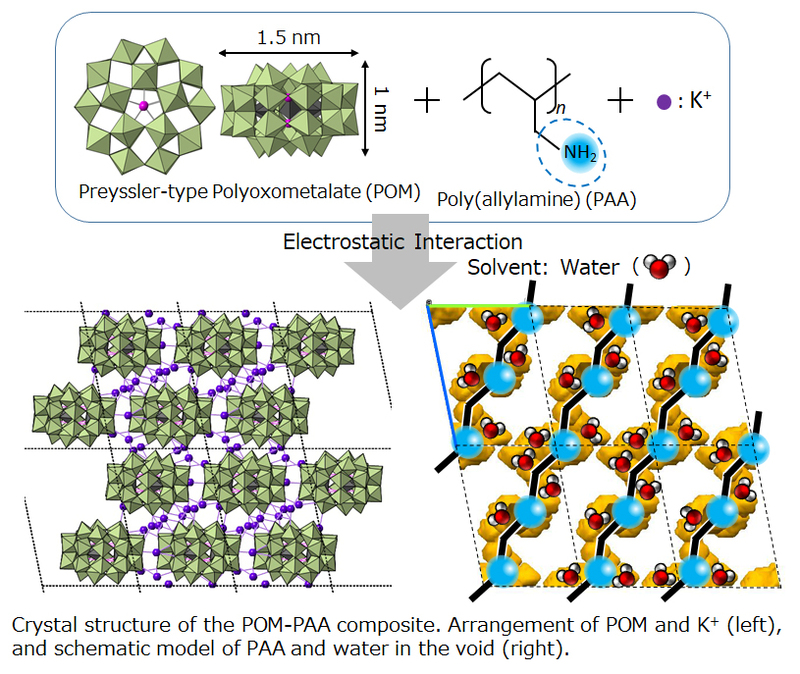 According to these ideas, in this work, another student of my group Tsukasa Iwano has utilized a Preyssler-type [Bi(H2O)P5W30O110]12- POM and poly(allylamine) (PAA), which improved the proton conductivity significantly to 10-2 S cm-1, which is comparable to those of commercial polymers. Thanks to Prof. Junko N. Kondo and her group member Ryota Osuga (Tokyo Institute of Technology) for the in-situ IR spectra measurements to analyze the states of water in the crystal, and Prof. Takashi Uemura and his group members Dr. Takashi Kitao and Kayako Honjo (The University of Tokyo) for the Raman spectra and DSC measurements to confirm the presence of PAA in the crystal. This manuscript would never have been accepted without their valuable contributions. Finally, we would like to express our sincere gratitude to the constructive comments of the referees. Their comments have helped to improve the manuscript significantly.